This Ellie Foreman short story combines technology with crime. 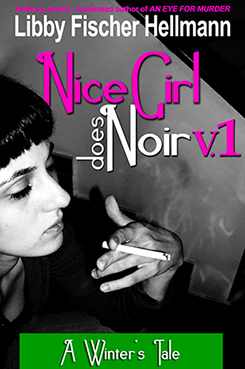 It was published in 2005 in the TECHNO-NOIR anthology edited by Eva Batone and Jeffrey Marks. Bear in mind that this was the pre-Facebook and Twitter era. So when he was found dead at his keyboard on a blustery January morning, his screen saver winking over his lifeless form, no one seemed overly distressed. Except his wife Lisa, who reportedly was so devastated that Lew, our village pharmacist, hand-delivered a prescription of Xanax to the house. “With three refills,” Susan said as we power-walked down Happ Road that afternoon. Snow crunched under our boots. Though the roads up here are always clear, except for mounds of dirty snow on the curbs that last until April, people neglect their sidewalks. Probably because there aren’t that many to begin with. Sidewalks. And people. Susan flashed me her Cheshire cat smile. I’ve never figured out how she knows exactly what’s going on in our tiny community, but I’m happy she does. I’m even happier she tells me about it.